New Castleford Tigers signing Garry Lo. Castleford Tigers have confirmed the signing of winger Garry Lo from Kingstone Press Championship team Sheffield Eagles. 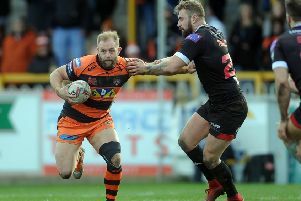 Lo has signed a two-year deal with the Tigers, with a club option for a third year, and it has also been agreed with both clubs that the player will return on loan to Sheffield when not required by the Tigers. The Papua New Guinea International has had an impressive strike rate in the Championship having scored 33 tries in 28 games during the 2017 season. The winger joined the Eagles in 2016 and has scored 45 tries in 44 games since debuting for the club. Prior to moving to England, the 23-year old represented PNG Hunters in their inaugural season in the Queensland Cup where in 2014 he was awarded the top try scorer award. Lo cannot wait to join up with his new team-mates and experience Super League. Tigers head coach Daryl Powell said: “Garry Lo has been a really exciting player for Sheffield over the last two years. “I’ve had a good look at him and I think he will fit perfectly into the way that we play. Castleford CEO Steve Gill was delighted to confirm the news today: “Gary is an excellent prospect, and at 23 years old he is a perfect age to move up into Super League from the Championship. Tigers fans will be able to get a first glimpse of Lo in action this autumn when he will represent Papua New Guinea in the World Cup. Cas will play Sheffield Eagles in a pre- season friendly early in 2018 as the Tigers prepare for the 2018 Betfred Super League season.